- Jill Bailey - - Hey, Bailey! A Plat Map Love Story. You all know that I'm all about Teaching for Artistic Behaviors. Sometimes our studio artists develop skills, sometimes they make connections. Sometimes... they do BOTH. My studio artists spend a lot of their free time immersed in hunting, snowmobiling and fishing. It's important to know about property lines and how to read a plat map so we can find out how to access that small, obscure lake up north where some guy at the local eating establishment bragged about catching their limit of walleye or northern. Although, it's up to you on whether or not you believe the fisherman's tale. Some fishermen don't want their favorite fishing spot to become populated with outsiders. Ya gotta keep it a secret! Shhhh! Sometime we have to use the local plat book to find out who owns that property down by the creek because you hit a deer with your bow & arrow, and it stumbled away on to property that doesn't belong to you. Then you have make polite phone calls to the neighbor, asking permission to search for the injured deer. You better not waste that venison! Don't want to get caught lurking on his trail camera. That'd be trespassing. That may or may not have happened to my kids with our neighbor. I jumped on board with her plat map unit. I wanted my 8th grade students to learn about the printmaking process before they dove into using linoleum, so why not make a large scale version of our local plat map? ​That's what we call arts integration. Developing new art skills while making connections. Overlapping content with other subject areas. It'll be The Town of New Holstein, maximized in size! Read that to yourself with a loud, booming announcer's voice and it's double the fun. Add in some property cards in the style of Monopoly, and it's like a game. Sort of. Maybe if I had money with it? ​C'mon... I even made the cards with sheds and farms rather than hotels. Because we're rural Midwest. Our property values go up with sheds and barns, filled with snowmobiles and fishing equipment. And let me say... I made up those numbers. I have NO IDEA if Danes' Dairy Farm property is worth $425. Pfff! I think I'm a bit low on that estimate, but don't ask the Danes' family because that'd be rude. Let's just stick to the topic of printmaking and reading plat maps. Because that is the whole point of using the property cards! In the end, we all have to apply our map reading skills by choosing a property card, finding the property on the map and labeling it with the landowner's name. ​We got to use fun, new materials in the process. Welcome to Scratch Foam. From hence forth, I call it what it is: flat sheets of Styrofoam that can be drawn on with a pencil. ​You can see that there's not a whole lot of creativity that goes into this process. GASP! I know, it's so unlike me. The creativity will come once they understand how the printmaking process. Artists develop skills. Artists make connections. Did you know that a brayer is not someone who makes donkey sounds? It's a printmaking tool! I bet you're not going to forget that one now. I had some students who absolutely despised the word gouge tool. ​It gave them the heebie jeebies. It made them want to gouge their eyes (ears?) out. Buwahaha! Bad middle school humor. But be forewarned. Someone, sometime, will want you to call it a carving tool instead. Just go with the flow. 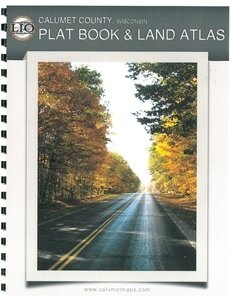 As for the flow of things, here's the learning guide that takes them through the steps of making a plat map print. And if you really are interested in the flipped video instruction, here's the crazy playlist. Just be warned; I market this to middle school age kids, ok?. It gets the point across and eliminates me having to repeat myself a million times; because who remembers what I said in a demo a week later?! My studio artists watch the video when they're ready and it makes everyone happy. Now that my studio artists know how to print, it's time for me to put together some creative inspiration for their soft-kut linoleum challenge. If you have any suggestions on your favorite printmaking artists, let me know! I had the pleasure of facilitating a session of Professional Development for other like-minded, fantastically fun ART teachers in Sun Prairie. This happened over a week ago, but it was just what I needed to finish off the year with some oomph! Go ahead and pan/zoom your way through this Prezi. Shazam! That's how we do it... no repeats needed (thanks Pete & Repeat for going on that boat ride!). The big question is, are giving our students opportunities to engage on different levels in order to meet the four human drives of mastery, interpersonal, understanding and self-expression? This article has been my ah-ha moment for the school year, as I strive to create student independence. I like to draw while listening to speakers. I take their message and illustrate it in a way that makes sense for me. 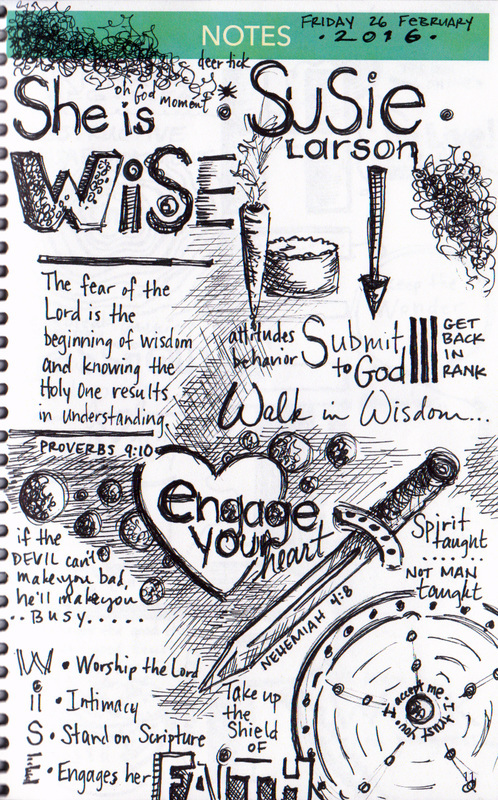 While I may appear to not be listening to the speaker because my head is downcast and my pen is always moving, I'm truly engaged in the teaching. The drawing grounds me. It focuses me. 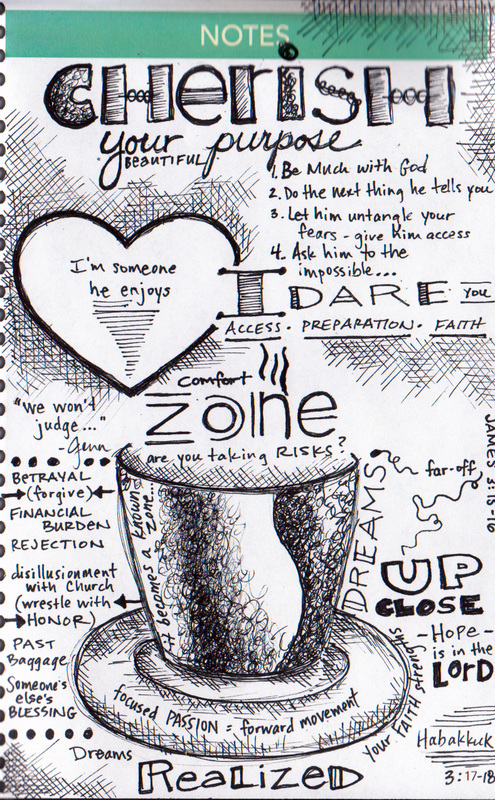 I had the honor of sketchnoting while Susie Larson shared her messages of faith, perseverance and freedom "Through God's Eyes" at the Appleton Alliance 2016 Women's Retreat. I admit, I smiled to myself whenever I heard Susie talking about being engaged. While she was using the term as a reference to being accessible to God, I was making a connection to my classroom environment where I'm always talking about having students "engage and persist" in their art-making. I want my students to make art with confidence. I want them to engage their heart and care about what they create. Well, there you go. That's what I'm doing. Sharing my work so others can be inspired to give it a try. 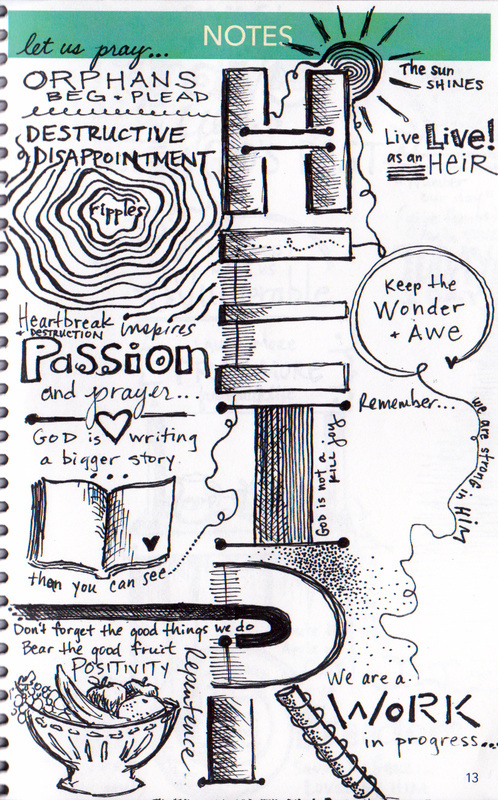 My meandering doodles may not make sense to you, but I look at them and I remember Susie's words. So many of her messages would be beneficial to my middle school students, such as the desire to be part of an imaginary inner (social) circle. Even adults need to be reminded that the inner circle does NOT exist. Be brave. Be free from that notion. In all honesty, the lemonade stand is a long stretch in relation to the main concept of Susie's message. She made mention of a lemonade stand and I thought "Oh! that is fun", and I began to doodle. 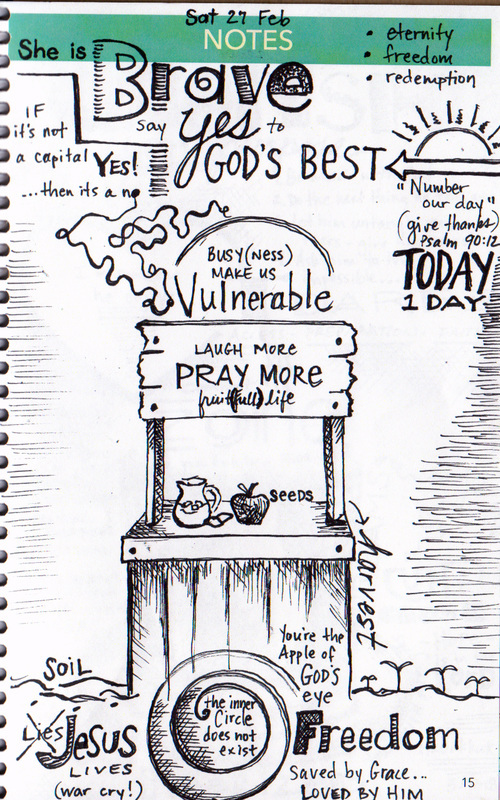 I wove the image in as part of her apple/seed analogy that led into a reminder that we should all live a fruitful (full!) life where we laugh more and cherish our purpose. THEN... at our final session with Susie, she talked about taking risks. Once again, I made a connection to my classroom. Are my students pushing themselves outside of their comfort zone with the art materials? Are they taking risks with their ideas? She also mentioned the importance of finding those friends who accept you without judgement. At which point, I nudged my sister-in-law sitting next to me. I've heard that statement from her mouth a many of times: "We won't judge!". 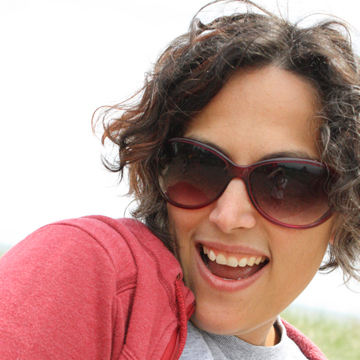 Thank you, Jenn, for bringing me along for another wonderful, spiritual retreat, without judgement. Welcome to the New Holstein Middle School art STUDIO, where my students are called ARTISTS. That's what happens when Teaching for Artistic Behaviors (aka: TAB). In a nutshell, it's a choice-based curriculum. 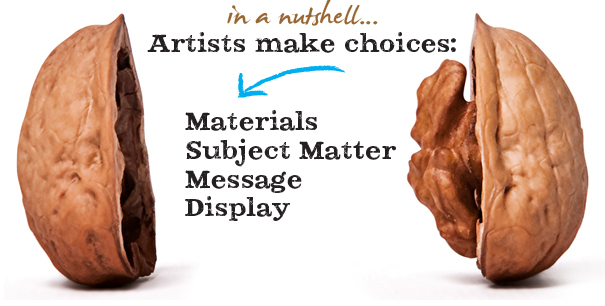 It's where students get to choose their materials, develop their own ideas and struggle through the process. Isn't that what artists do?! 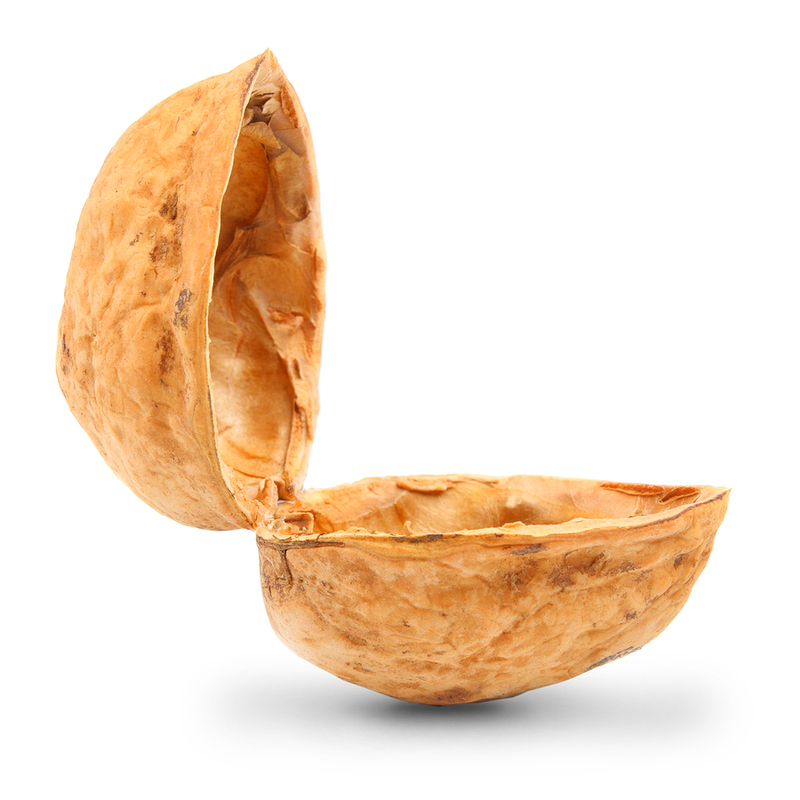 That's a really big nutshell. SShazam! I am no longer the "art educator". 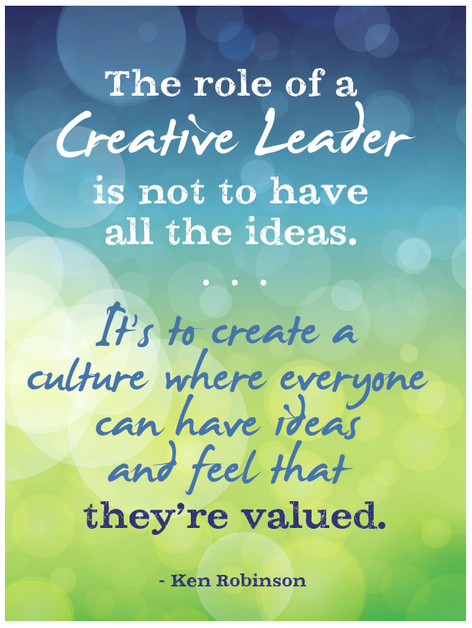 My new title is "Creative Leader". So here's the deal. I'm trying really hard to create a classroom culture where new ideas are praised and all artistic abilities are celebrated. The emphasis is on building a portfolio of artwork that includes reflections that tell me what they've learned. How did they challenge themselves? We've been practicing this on a smaller scale through a Google Form (survey) that students fill out when they complete an artwork. It's based on the Studio Habits of Mind. On a larger scale, students are also blogging about it - when I assign it. In the spirit of choice, this quarter I plan on giving options: a written blog post, a video blog or a live presentation to the class... because sharing ideas is fun. ... and this is how ideas develop. One thing leads to another. ... and this is how topics transition. 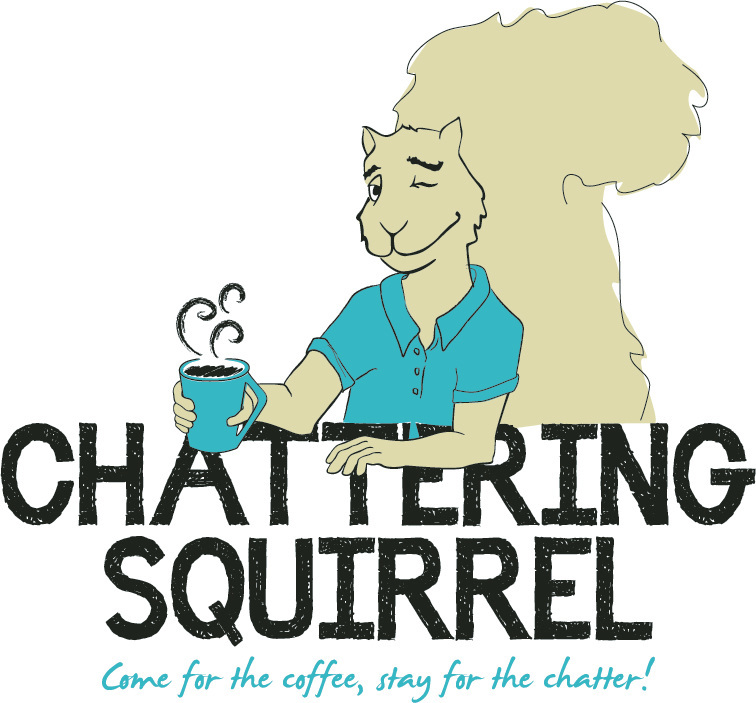 I once did a tshirt design for a coffee shop called The Chattering Squirrel. 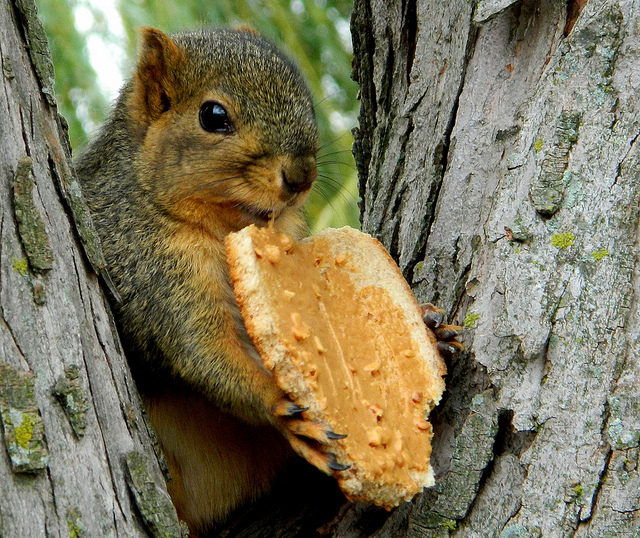 We're close friends with the owners and this guy that runs the place is a social squirrel. To me, that means that he's fun, energetic and has a heart of gold. So, his wife asked me to draw a caricature of him as a squirrel, holding a cup of coffee. I'm still unsure if I like it as a tshirt, but it was fun capturing his personality in the design! I want you to know that his wife requested the 'hey, LADIES' wink. I love that couple. So there's your proof that idea development is an important real-world skill to practice and develop. You never know when you're going to be asked to draw something nutty. Wink. Can gut feelings be expressed? I had an intriguing conversations with a colleague today about our reflecting practices. We were happily working away on our self-review as part of our Wisconsin Educator Effectiveness process. I reached Domain 4a: reflecting on teacher practices. 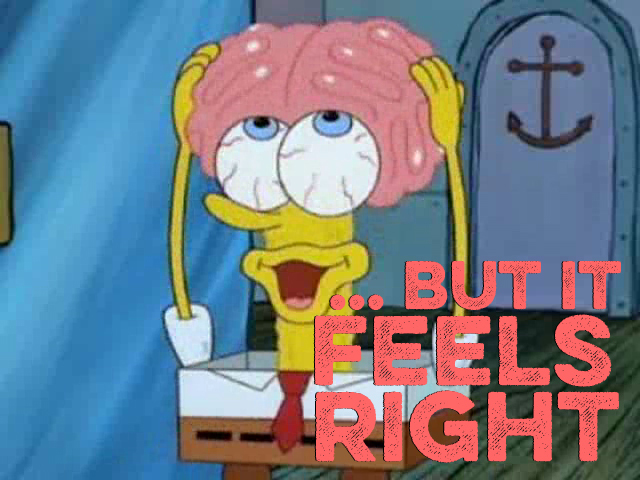 I was all ready to rate myself as "proficient" with a rationale of "if you could only see inside my head." Scary. Like Spongebob scary. That's when I start talking out loud, to anyone sitting around me who will listen: "You know, I'm always thinking about my teaching practices. I'm thinking about it on my commute. I'm thinking about it while I'm mulching leaves. I'm trying to not think about while practicing yoga." Mrs. Tomchek was kind enough to listen and started raving about this video by Simon Sinek who explains that the biology of our brains doesn't allow us to express those things into words. Uhhh.... WHAT? I made her show me, because let's be serious, if biology says that our brain is holding us back, then I can't expect my students to do the same. Why would I try to start this blog? So she proceeded to play this little video - ok, not little, it was LOOOONG, but she showed me an itty bitty clip to prove her point. The main message that Simon Sinek communicates in this video clip is: The goal is not to do business with people who need what you have; the goal is to do business with people who believe what you believe. If you're one of my students reading this, I forsee this conversation is going to come back to haunt me. Now let's connect this with art. I expect my students to explain the art-making process. What did you do? What materials did you use? What were you successful with? What did you struggle with? Why was it important for you to make this? According to Sinek, it's difficult to explain the decisions we make in the art-making process because it stems from the limbic part of the brain that causes things to just "feel right". It comes from the heart. From the soul. From the Force. (My kids are watching Star Wars while I'm writing this; I couldn't resist.) "Always in motion, is the future," says Yoda. Dang, I like that little dude. I kind of wish I could carry him around in a backpack all day so he could whisper words of wisdom. I bet that Yoda and Sinek would get along. I bet that they would do business together because they both believe that you need to "Start With Why". In order to motivate my students, I need to explain WHY it's important to write and reflect in art. Let's be honest, it's been a cause of debate and I've realized that many of my students don't see the value in doing it. So I'm searching to speak to the limbic part of their brains and it is going. to. BLOW. THEIR. MINDS. 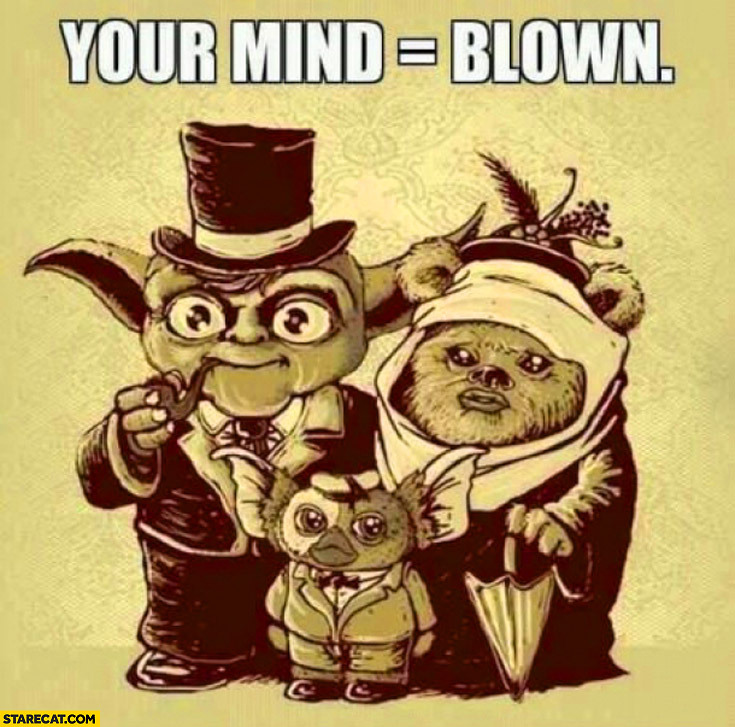 Like Yoda + Ewok = Gremlin. 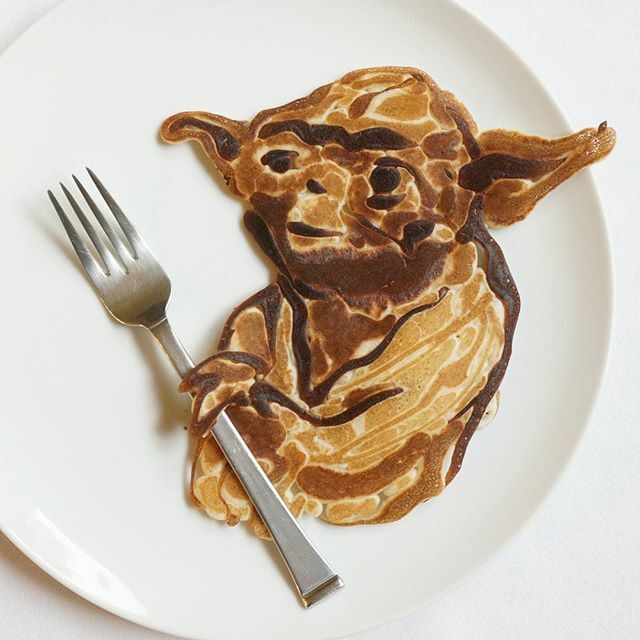 Or this artist, Nathan Shields at Sai Pancakes who uses pancakes batter to cook up some art. This guy puts my husband's R2D2 pancake spatula to shame. In the meantime, I'm going to eat some pancakes (gluten-free... ugh) and think of some more ways to amuse you all with fun art. How would Yoda say that? "More ways to amuse you all with art, I will think of."